We at Winn Rock are proud of the history that surrounds us. 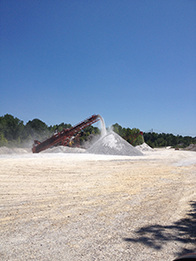 Just four miles west of Winnfield, Louisiana's timber capital, there have been aggregate removal operations in place at our location for over a century. First, limestone was produced, which was used for roads crisscrossing the state during and after Huey Long’s involvement in transportation. In 1952, when the limestone ran out, mining switched to gypsum, which was used as a retardant to control the curing time in cement. Eventually digging reached massive reserves of anhydrite, which has proven to make the best and longest lasting roads in the state. Anhydrite has the unique quality of "setting up" with no compaction necessary. 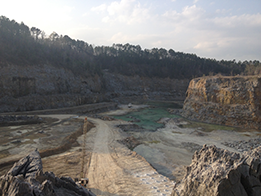 Our quarry is one of the only anhydrite quarries in the country and the only one in the region. Our material hardens as time passes and is perfect for many applications. Acquired by the Dunham family of Baton Rouge in 1949, the quarry has run with a high level of professionalism and quality for over 60 years. If you live in the state, chances are you have benefited from the energy, transportation, or lumber that our material has helped provide, and we are very proud of that. With at least another 50 years of reserves, we do not intend on slowing down. Our location in the middle of Louisiana guarantees accessibility for all of your needs. If you need a road, choose only the best. Choose Winn Rock.